If you are planning on building your own computer, whether it is for a high end workstation, or a custom gaming rig you will definitely be looking at different video cards. This post will cover the overwhelming variety of different video cards, and hopefully answer some questions that you might have. 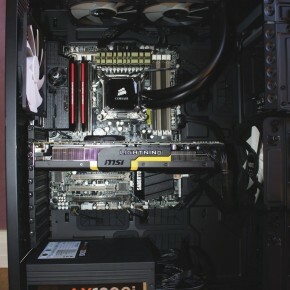 An example of an MSI GeForce GTX 780 video card in a custom built gaming machine. 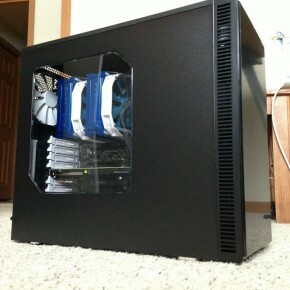 Close up of a Quadro 4000 is a custom built workstation. First of all, if you have already looked a little at video cards, you will have noticed a lot of different specs, which will be very confusing, and can be pretty misleading at times. The first thing that you want to do is to just take a step back, and get your needs understood. Decide what your real needs are. What programs will you be using that will require your video card? What resolution are your monitors? How many monitors will you have? If you’re planning on gaming, what games will you be playing, and how high performance do you want? Once you have that all figured out, decide how much money you want to spend. If you need help budgeting out your gaming computer, you should take a look at a handy guide that Logical Increments has put together. It not only has suggestions on what video card would be ideal for your pricerange, but they also have compiled suggestions for all of the different components that will go into your computer. Now that you have all your needs and budget set out, you should be ready to start looking at the different cards. The first thing you’ll notice is two different brands – AMD and NVidia. Their product names will look very overwhelming, but you might think you’d be able to get some sort of idea of power out of them. This is not always the case, as naming conventions will be confusing and convoluted. For example, the NVidia 660 has a sister card, the 660 Ti, which can sometimes outperform the higher end 670, but all these cards have counterparts in AMD’s lines like the 7850, etc. Don’t get caught up in all the names or brand loyalty, and just forget it all for right now. You’ll also see other specs such as CUDA cores or and clock speed. Unless you already know a lot about video cards, these won’t mean much to you and will only add to the confusion. Comparing CUDA cores and clock speeds is a bit like comparing horsepower and torque between models of cars. You can compare them all you want, but you will never know how well the car will actually perform without knowing its road test results. The equivalent to a road test for a graphics card is the benchmark. Below is an example. This is an example of the listed specs for an NVIDIA GeForce GTX 780. You can examine and compare these specs with other cards all you want, but a lot of the cards in the same pricerange will have very similar specs, and comparing just the specs side-by-side will get you nowhere. This is where benchmarks come in. There are benchmarks for different video cards on everything from specific programs that you will be using, to the frames per second in a specific video game, to a “score” received from a specific benchmarking program. You should not really pay attention to the benchmarking programs, as they can skew results and make it seem that card A is better than card B, when in a real world setting, the other card B will outperform card A. Just like the card analogy from before, you want to look at real world tests, not synthetic benchmarks. If you are building your rig as a gaming machine, then you will obviously want to look at video cards especially tailored to perform well in gaming scenarios. These are cards such as the AMD Radeon HD and Rx series cards, and the Nvidia GeForce GTX series cards. When comparing different cards, you will want to compare the fps that they can pull in the video games that you will be playing. You will obviously also want to keep in mind your price range and the resolution that you will be playing at. For most gamers, 60+FPS at 1080p resolution is the ideal performance, as the majority of monitors bought for gaming rigs are 1080p monitors with a 60Hz refresh rate. I have a word of caution to those out there with very large budgets. You may have seen gaming video cards out there priced at very high numbers. The very expensive gaming graphics cards usually do not have good price to performance ratios, meaning that as the price goes up, the performance does not necessarily scale to those proportions. Most of the time, you can get much better performance by buying two lower end video cards and hooking them together in SLI/Crossfire. Again though, SLI and Crossfire do not scale in a straight line either. You usually do not see performance increases worth the amount of money you spend once you go past two video cards hooked together. Now, if you are building your computer as a workstation to use programs such as AutoCAD, Maya, or other programs that require a high rendering power, you will want to look at video cards that are meant to run in such scenarios. These cards are included under the AMD FirePro series, and the Nvidia Quadro series cards. NVIDIA’s top of the line Quadro workstation graphics card – the Quadro K6000. You will want to compare the various cards’ performance results in the programs that you will be using the most. Now this market is usually not very sparse with decisions that you will be able to make, so the main thing that you will need to keep in mind is your budget. There are some seriously expensive workstation graphics cards out there, and the performance they offer is worth more or less to different people. Again, Tom’s Hardware has compiled a very nice comparison of benchmarks and performance results of different workstation graphics cards, which can be found here. Price the budget that you have in mind, the performance you are looking for, and what types of applications you will be running (games vs. rendering software). If you are looking for a gaming video card, look at the price vs. performance in regards to how many FPS a specific card gets at the resolution that you will be using. If you are going to build a workstation, you should look at the price vs. performance in the different applications that you will be using.Don’t forget to check back in a couple weeks for the next article in this series: CPU Pros and Cons. Good luck, and happy building!